Windows 7 provides tools that can be used to repair the operating system if it becomes damaged. On some systems these tools are installed in a special recovery section of your hard disk, if not on your system, you'll need to boot from the installation disk. If the repair tools are installed on your system, make sure all floppy disks, CDs, and DVDs are removed from your computer, then then restart your computer using the computer's power button. Press and hold the F8 key as your computer starts. If the Windows logo appears, you need to try again. Wait until the Windows logon appears, then shut down and restart your computer. If you need to boot from the installation disk, your computer will need to be configured with the CD /DVD drive first in the boot sequence. Do this by restarting the system and entering the BIOS setup screen. To enter the BIOS setup screen, you'll need to press a special key as the system boots. Which key to press is specified at the bottom of the screen when you first restart the system. If the repair tools are NOT installed on your system, and you didn't receive a system restore or installation disc with your system, you can create a System Repair disc. To create a System Repair Disc, open Control Panel and, in the System and Security group, click on Backup and Restore. In the Backup and Restore window's left panel, click on Create a System Repair Disk. A system repair disc can be used to boot your computer. It contains the system recovery tools. However, you need to have created a system repair disk before hand in order to use this option. You can't use a system repair disk from another computer because it checks the product key. On the Advanced Boot Options screen that appears, use the arrow keys to highlight Repair Your Computer, then press [Enter]. 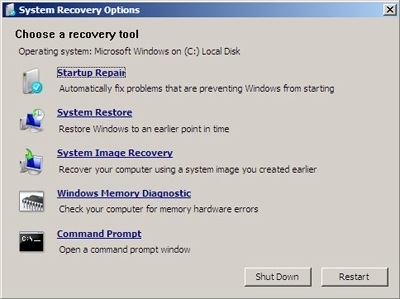 The System Recovery Options screen will appear. 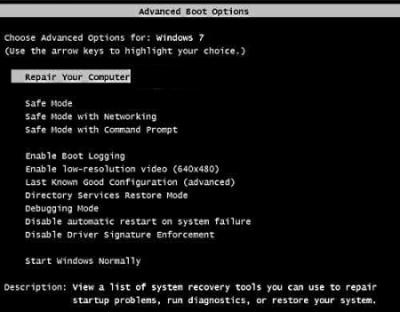 The System Recovery Options screen lists several tools that can be used to repair the operating system if it becomes damaged.